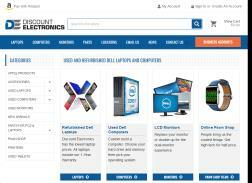 Online retailer for affordable refurbished replacement parts for Dell laptops and PCs, based in Austin, Texas. 10% Off D-Series Modular Battery & 65W Auto/Car Adapter Power Package. Compatible with Select Dell Latitude & Precision Notebook Computers. Get 10% Off All Orders. Expires on 07/05/2015. Get 70% Off Customize used Computer.